As I just bought a new miner (Rockbox new R-Box) I was looking into a convenient way to operate and administrate this box. Currently it is running on a Windows 7 machine using cgminer (a tutorial will follow on that one). 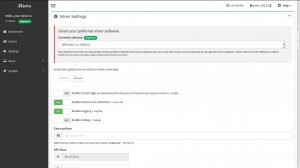 As I got some Raspberry Pi’s lying around, I was looking into way how to setup one of the Pi’s as controller. After digging around I bit, I found first Minepeon. But after a bit of research on the project page and the forums, it seems this project is pretty much dead: Latest release is from early 2014, forums not having any recent post except for one thread with the title “Minepeon Project Died?“. Sounds like the tool you need? That is exactly what I thought as well. Browse to the Minera project page and download the prepared image for your Raspberry Pi in the download section. 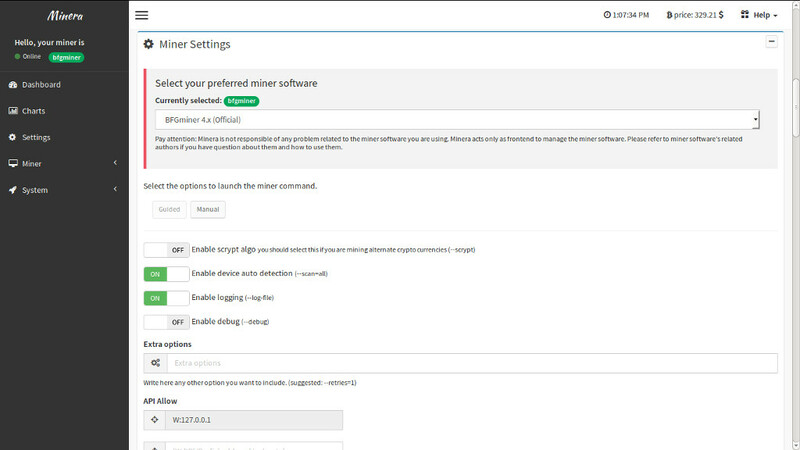 Click on “Auto Install” and the download starts. Once the download completed, extract the zip file with your favourite zip tool (like Winzip, Winrar, Archive Manager). 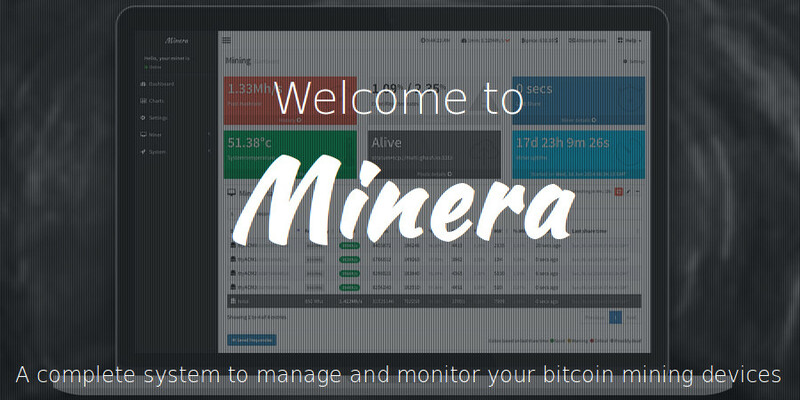 This gives you the the file minera-latest.img. As the next step, copy the image to the SD card. Depending on the operating system you are using, it may vary a bit. As mentioned before, this SD card needs to be at least 4gb. Writing the image to the SD card may take a while. Once completed, put it into your Raspberry Pi, connect the Power/USB and the HDMI cable to it, attach any mining devices and boot it up. The default password is “minera”. 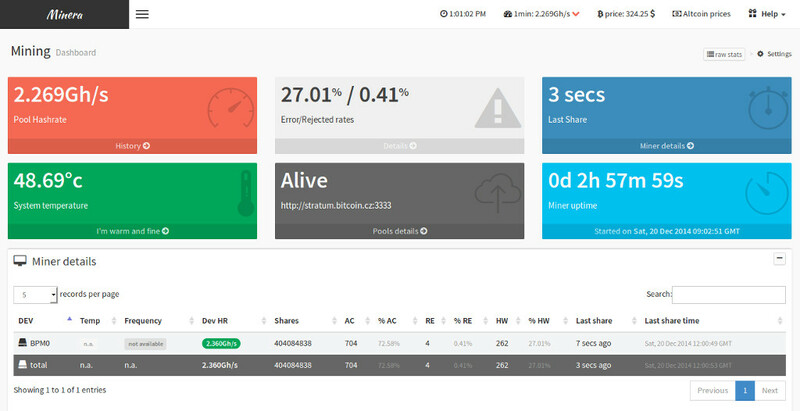 There you go; welcome to your mining dashboard. In this tutorial we learn how to install the latest BFGMiner on your Linux Debian (or Ubuntu) machine directly from GitHub. At the time of writing version 3.10.0 was the most current one. 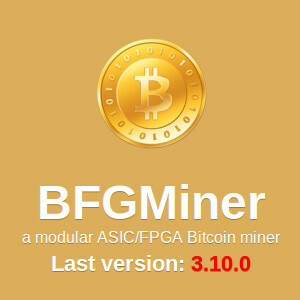 First we will install all the required tools to build BFGMiner, then we download it from the GitHub repository and then finally compile and run it.